WASHINGTON (AP) Coach Steve Kerr’s Golden State Warriors allowed a 16-point lead shrink to two at halftime against the Washington Wizards. Nothing that a typically dominant third quarter by the Warriors couldn’t solve. 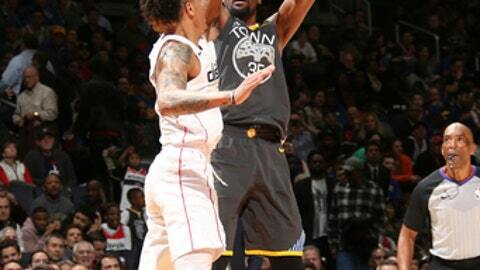 Using a 16-4 run out of halftime, Golden State won for the seventh time in eight games by beating the Wizards 109-101 as Kevin Durant scored 32 points, Stephen Curry added 25, and Klay Thompson helped limit Bradley Beal to eight Wednesday night, a day after the Warriors took schoolkids to a museum instead of visiting President Donald Trump at the White House. Asked for the secret to such success at the outset of the second half, Kerr couldn’t help but respond with a joke. In his team’s previous game, a win Monday at the New York Knicks, the Warriors held a 39-18 edge in the third quarter, the seventh time this season they outscored an opponent by at least 20 points. This time, it was 27-14. Wizards coach Scott Brooks’ take on the Warriors’ dominance right after halftime? ”You could probably easily start off with saying they have four All-Stars. That’s a pretty good start. They should have a pretty good `every’ quarter,” Brooks said. Beal came in averaging a team-leading 23.7 points but he missed his first nine shots and had zero points at halftime. His first basket came with under 5 1/2 minutes left in the third quarter. A lot of the credit goes to Thompson. The Wizards were again without All-Star point guard John Wall, who sat out his 14th game in a row after surgery on his left knee, but they trailed only 58-56 after two quarters Wednesday. Washington was playing on the second half of a back-to-back after winning at Milwaukee on Tuesday night, and a bit of lethargy showed early on while falling into a 16-point deficit in the second quarter. ”We came out a little lackadaisical, a little sluggish,” Beal said. The Warriors, meanwhile, were well-rested after getting Tuesday off. They dispensed with the reigning NBA champs’ traditional White House visit while in town, opting to spend the day touring the National Museum of African American History and Culture with students from Durant’s nearby hometown of Seat Pleasant, Maryland. Warriors: 21-3 against Eastern Conference opponents this season, 12-1 on the road. … Entered the day tied with the Rockets for the most wins in the NBA this season with 47. Wizards: Otto Porter Jr. led Washington with 29 points and 10 rebounds. … Washington has scored at least 100 points in 15 consecutive games, the longest active streak in the East. Warriors: At Atlanta on Friday. Wizards: Host East-leading Toronto on Friday.